Join us to celebrate this sky-high milestone with a chance to win an unforgettable experience in a weightless environment. All you need is an adventurous spirit, Veeam has the rest covered for you! We’ll take care of your flights to the U.S. take-off location, hotel accommodations, the ZERO-G Experience® itself, and even give you photos and video footage so you can share your special memories. Veeam offers 24.7.365 Availability and one of the highest industry-satisfaction rates. Now, we want to take you even higher. That’s one small step for a man, one giant leap for Availability! Get aboard! Make a purchase to become our 200,000th customer, or take our simple quiz and you could win the memory of a lifetime! NOTE: This is a global contest, which began on May 19, 2016 and will continue until August 31, 2016. 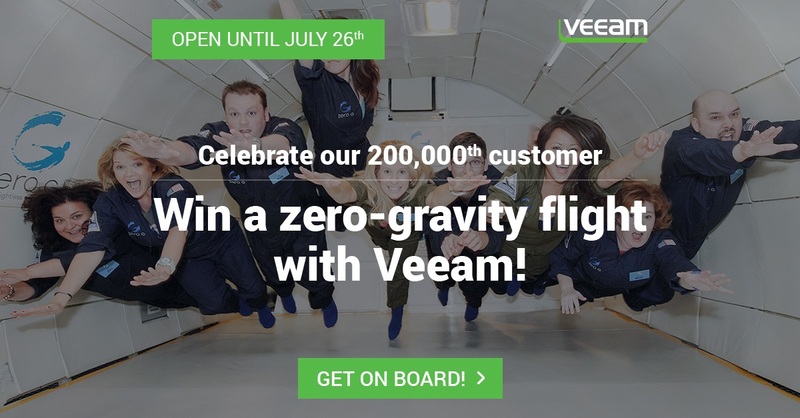 The three quiz winners will be randomly selected and announced at a later date, along with Veeam’s 200,000th customer. The flight will be operated by ZERO-G Corporation.